Be the first to share your favorite memory, photo or story of Natalie. This memorial page is dedicated for family, friends and future generations to celebrate the life of their loved one. 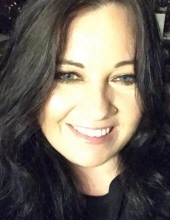 Natalie Catherine King, age 47, Sarcoxie, Mo, passed away Friday afternoon, February 8, 2019 at the Freeman West Hospital, Joplin, Mo. She was born October 6, 1971 in Jasper County, Missouri to the late Jerry Lee Curry and Karen J. (Arner) Curry. She was a 1990 graduate of Carthage High School. Natalie then received her associate degree in marketing from Missouri State University. She married Steven King on February 21, 1999 in Carthage, Mo. She worked as an office manager of Robinette, and Orkin Pest Control, more recently she helped her husband Steven with the buying and selling of vintage and priceless antiques. She was a member of the AQHA and truly loved showing horses, watching the Cardinals and spending time with her family & friends. Survivors include her husband, Steven, Sarcoxie, MO; and one son, Jared King, Sarcoxie, MO. She was preceded in death by two brothers, Lonnie Curry and Gregg Curry. Graveside services will be held at 2:00 PM Tuesday, February 12, 2019 at Park Cemetery in Carthage. Online condolences may be expressed through www.knellmortuary.com. Arrangements are under the direction of the Knell Mortuary. To send flowers or a remembrance gift to the family of Natalie Catherine King, please visit our Tribute Store. "Email Address" would like to share the life celebration of Natalie Catherine King. Click on the "link" to go to share a favorite memory or leave a condolence message for the family.